Rajasthani Laal Maas – Mutton Curry in fiery Red Sauce made with Chillies and Garlic- pressure cooker and Instant Pot recipe. This Mutton curry is a celebrated Marwari royal delicacy made with indigenous Mathania Red Chillies from an ancient village in Rajasthan called Mathania.It is usually eaten along with unleavened(which means without yeast) breads made with locally available millets like Jowar and Bajra during the winter months.Read more about millets and how they compare with wheat and rice on my how to introduce Millets in our diets. This recipe is especially important to me because my ancestors hail from Rajasthan.I feel it’s my duty to dive deeper into this cuisine so that I can introduce it to my son.In my opinion, there is no better way of educating our children about culture and traditional than food. Most food evolves with time and sometimes get’s lost in the popular recipes of the day.My hope and endeavour here is not only to record the recipe but also to make it more reachable to people who want to make this at home. Ideally, the true version of Laal Maas is made with traditional Mathania chillies which give it a characteristic fiery red colour and taste.Mustard oil, Garlic,Cinnamon and cloves lend this mutton curry, it’s characteristic flavour. In my experience, Mathania chillies are extremely difficult to source.You could substitute them with Kashmiri Chillies which are much more easily available across india and abroad.Rest of the curry is free of substitutions and made with easily available ingredients which shouldn’t be difficult to find. 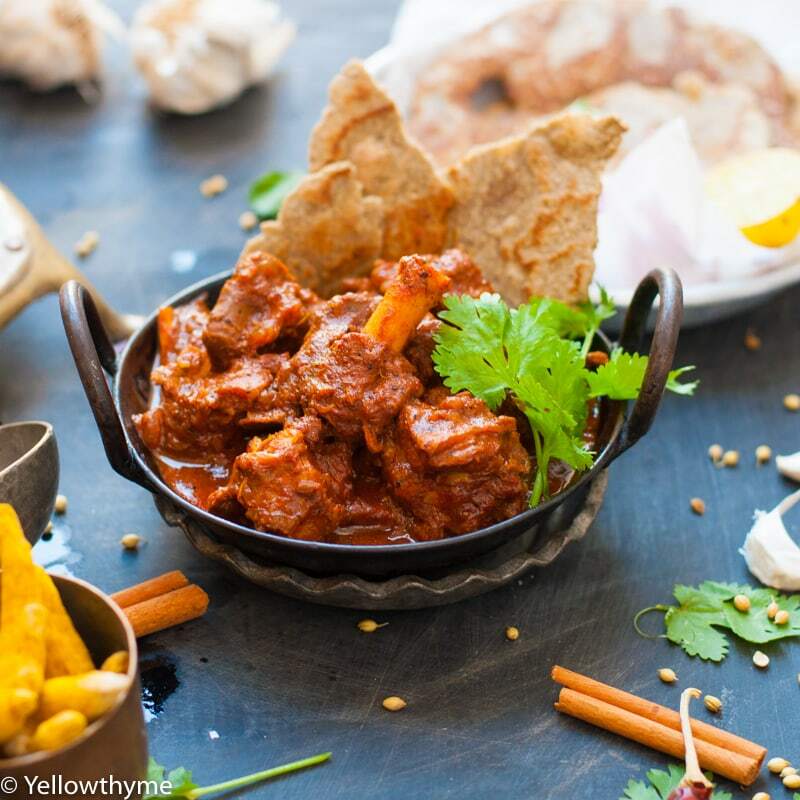 There are a lot of fables around how this curry came about.Some say this was historically made with game meat,hence sometimes called Rajasthani Junglee Laal Mas ,instead of mutton but there are other stories which totally refute that origin. A lot of people compare Laal Maas to Rogan Josh but they are completely different in their texture and character. I will be frank, I am not a big fan of mutton.The only time I like mutton is when it’s falling off the bones.Otherwise , I swear to you I prefer Bhindi over it! It’s very important for me that the mutton in my curries soft and pliant.There are two important factors that contribute to that.One is the kind of cut used. Everytime I have used “curry cut” mutton I have been disappointed. With mutton, it’s best to ask for a particular cut- I prefer Leg or Shoulder. The other factor is the time the mutton is cooked for.Mutton needs to be cooked for way longer than chicken.Slow cooking and marination also makes a much bigger difference with mutton. Pressure cooking works wonder with the texture too. I make this in two ways- in traditional pressure cooker and in the Instant pot.In the recipe I will share the way to make it both ways. Marinate the Mutton in yogurt, turmeric,coriander powder and about 2 tsp of salt.Add half the Ginger garlic Paste. Sauté all the ingredients listed under masala -Chillies,green and black cardamoms, cinnamon stick, cloves,bay leaf, coriander seeds and cumin on low flame. Add 1 cup of water.Bring the masalas to a boil.Set aside to cool.Once cool, Strain the spices.Reserve the liquid and Grind it into a paste. Heat the oil in the pressure cooker.Once hot, add the onions. Sauté the onions till they turn light brown to goldensih- Almost fried.Add the ginger garlic paste. Saute for about 1 minutes. Add the mutton with the marinade.Add the Spice paste.Give it a mix.Test the Salt.Add more if needed. Now add the reserved liquid from boiling the masala which is around 1 cup. Pressure Cook on Medium Flame for 30 - 40 minutes. Let the pressure release naturally.Open the Cooker.Adjust the gravy to your liking by adding more water or boiling it open to reduce the gravy. Heat the oil in the pot on the SAUTE mode.Once hot add the onions. Sauté the onions till they turn light brown to goldensih- Almost fried around 15-20 minutes.Add the ginger garlic paste. Saute for about 1 minutes. Cancel the SAUTE setting.Change it to PRESSURE COOK for 40 minutes.Make sure to change the setting to SEALING. This Curry can be served with Rotis, Bajra Khichadi or Dal Khichadi. Other Traditional Indian recipes you MUST try!